It all started with the painting of the Duke of Wellington by Goya. In 1961 it had been stolen from the National Gallery, but it was cleverly placed in Dr No’s secret lair in the movie of the same period. Fast forward to 1979 and James Bond movies were still ahead of the game. This time the whole premise of the film was based around space exploration and travel and the unique Columbia Space Shuttle, which was first due for launch in 1979. The timing of Moonraker was impeccable. And it remained so for a further two years when the US Shuttle eventually made it to space. The dramatic shots at the start of the movie showed a Space Shuttle launching from atop a Shuttle Carrier Aircraft. Despite the ambition of launching the Columbia Space Shuttle in 1979, it would be two years until the technical difficulties were overcome. It is perhaps understandable therefore, that people believed this is the way in which the Space Shuttle would launch. The weight and additional tanks would of course make this impossible, although subsequent theories and designs continuously work with that hope. The reason Moonraker showed a Shuttle Carrier Aircraft with a Space Shuttle on top was because that is exactly how the craft is transported to and from launch sites and testing facilities. The modified Boeing 747 was effectively a giant air ferry. The Shuttle itself, was named Columbia, after the late 18th century ship captained by Robert Gray. Columbia was the first American ship to circumnavigate the globe.The efforts to get a Space Shuttle into space was a decade long process. The contract was awarded in 1972 and the construction phase after design, began in 1975. The final assembly, when the public first saw images of the craft, began in 1977. The 1979 launch was re-scheduled after the thermal protection system was discovered to have faults. Moonraker was launched in June 1979, Columbia was scheduled for launch in December 1979. The world was full of anticipation and excitement. Sadly, the film would become to be considered among the worst in the canon. Oh, and people were looking forward to the Space Shuttle taking off as well - the modifications that took place would delay its first flight for two years. The video is above. This scale model kit by Revell costs just £18.40 and is made from 119 parts. It is 48cm c 42cm in size. The Space Shuttle features, textured surfaces, a moving "Beaver-tail-Rudder", three main thrusters, a rear engine cover and authentic decal stickers. The Boeing 747 SCA also has textured surfaces, four detailed engines, a similarly detailed under carriage, additional side and rear stabilizers, a Shuttle support cradle and an authentic decal set. This Space Shuttle and Booster Rockets kit by Revell, includes 97 parts. The 43cm high model includes a large fuel tank with two rocket boosters that were used to launch the Shuttle. 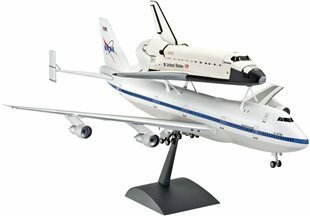 The model includes similar features as that above, and also a more extensive decal set: Orbiter "Enterprise", "Discovery", "Atlantis", "Endeavour" before 1998, and Orbiter "Enterprise", "Discovery" "Atlantis", "Endeavour" after 1998. This model is slightly ore complex and costs £22.99. Just click on the link to learn more.